Target 1 “Danger!” monster you control and 1 monster on the field; return them to the hand. 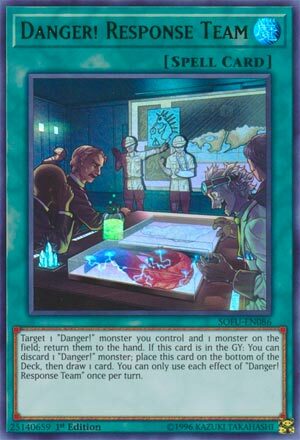 If this card is in the GY: You can discard 1 “Danger!” monster; place this card on the bottom of the Deck, then draw 1 card. You can only use each effect of “Danger! Response Team” once per turn. Danger week wraps up October on Pojo with our first card: Danger! Response Team. Danger get another support Spell card that acts like a double Compulsory Evacuation Device. This is a good way of getting something off the field that’s huge while cycling back a Danger monster of yours, as you can Special Summon it during the next turn or use it as discard fodder, which ties into the second effect of this card. Cycle Response Team back to the bottom of your deck with a Danger monster discard and get a draw on top, that’s a +1 to balance out the -1 you take for the first effect. Danger decks aren’t typically the kind of deck to use tactics to bounce and get around monsters, they typically just bulldoze their way through use swarm and power. Danger effects kick upon discarding, so you may get even more plus off the second effect. Monster removal is good, and with each Danger effect monster able to use each effect of theirs once per turn, you could do what I’d hinted at earlier and drop a small Danger monster, cycle it back with this to rid the field of a boss monster, then discard it using the second effect of this card. Dangers needed something in Spell form, as their awesome Trap card is just that: a trap. Dangers are aggro, they need to move, move, move! This gives them that offensive power in the same turn without having to wait. Everything about this card screams abuse. Happy Monday! Danger! Response Team is a Normal Spell Card that has two effects that can only be used once per turn each. The first is to target two monsters, 1 Danger! of yours and any other monster for bouncing back to the hand. I wish it didn’t target, but at least it doesn’t destroy. Sending Extra Deck monsters back to the Extra Deck is always the best option for their removal. Then Danger! Response Team refunds you the -1 that it is with a grave effect. At the cost of a Danger! monster discard from the hand you can place this Spell on the bottom of the deck to draw 1 new card. Since Danger! monsters tend to plus, I’d say run 2 of these since they’re awesome and recycle themselves. Looks cool, too, very consistent with the story they are trying to tell. We finally move away from Legendary Duelists and now onto Soul Fusion staring off with the new Danger! support this week. Staring off for Danger! is their new Spell, Danger! Response Team. Danger! Response Team is a Normal Spell that when activated you can target a Danger! monster you control and 1 monster on the field and return them to the hand. The hand effects of all the Danger! monsters are not hard once per turns, so you can return a Danger! you Special Summoned via its own effect to the hand and something big your opponent controls back to the hand, then you can use your own Danger! again in the hand and if they don’t hit it, then you’ll summon it back and draw 1 card. You can also bounce your own monsters, and sometimes self bouncing can be broken, hence why Brionac got an errata and Zephros is still good to this day, but I don’t know many practical applications with Danger! and bouncing your own monsters back to your hand except maybe if you want to bounce 2 Danger! monsters to increase the probability your opponent misses and/or have more Danger! monsters you can summon and draw via their own effects. The other effect is that while this card is in the GY, you can discard 1 Danger! monster to place this card on the bottom of the deck and draw 1 card. It’s really a one-for-one at first, discard for a draw and this returns to the deck to use again. All the Danger! monsters have discard effects to trigger to plus some more, so this is likely going to get you more advantage for that discard unless you discarded Dogman! or a Chupacabra! that wasn’t live. Both effects of this card are hard once per turns, which makes it a little less good, but still pretty good overall. I say it is worth throwing in a copy or maybe two in Danger! It is searchable off Nessie! still. Art: 4/5 Gotta study more about these cryptids, they are hard to find and you never know if you’ll find anything else about them ever again. I picked the cards this week for two reasons…one, Soul Fusion gave us new Danger! cards, which I felt was appropriate to review for the week for Halloween (and fun) and second, I picked the first week of Danger! cards we reviewed not long ago, so this seemed a logical move. Danger! Response Team opens this week, and I’m happy Danger! got some more support so soon after being released. This card is really good in Danger! to the point of almost being TOO good, which (my opinion), it would be if it were a Quickplay. Anyway, you Target a Danger! Monster you control and another Monster on the Field (yours or your opponent’s) and they are returned to the hand of the respective player(s). That, in itself, is a -1 for you, and generates you no real advantage. It does give you the fun ability of getting rid of an opponent’s Boss Monster or something you just would rather not/could not destroy. But if this card is in the Graveyard, by discarding a Danger! Monster to the Graveyard, which lets you Draw a card from your Deck, and return this card to the bottom of your Deck. As you may recall, Danger! cards actually enjoy being discarded as well, having various effects when discarded from revival to destruction. This is easily a 3-of in the Danger! Deck, and let’s drop too, that now, Danger! players have Card Destruction in their arsenal too.